Gaby, a young woman who was born with�cerebral palsy and is unable to speak or move, except for her left foot with which she communicates. Norma Aleandro, Robert Loggia & Liv Ullmann. Magnificent performances from an internationally-acclaimed cast, including Best Supporting Actress Academy Award and Golden Globe nominee Norma Aleandro, highlights this powerful story about a severely disabled woman who overcomes incredible obstacles to find her place in the world. Rachel Levin was a Best Actress Golden Globe nominee for her role as Gaby, a young woman who was born with cerebral palsy and is unable to speak or move--except for her left foot with which she communicates. But armed with a brilliant mind, loving parents (Ullmann, Loggia), and a nanny (Aleandro) who devotes her entire life to helping her. 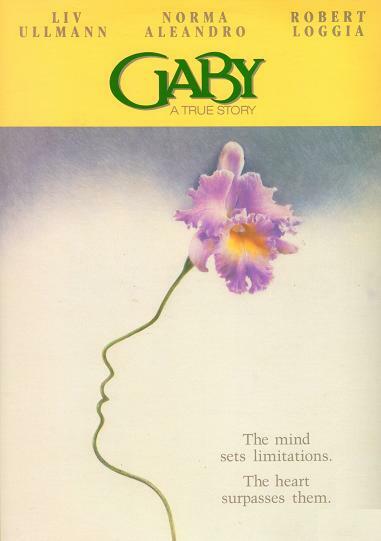 Gaby triumphs over her physical limitations to become a college graduate and a critically-acclaimed author. A moving drama of the indomitability of the human spirit, A film of great inspiration and courage, enormous humanity and dignity.